What Makes Organization Development Unique? Organization Development (OD) incorporates many different fields – psychology, business, human resources, sociology, communications, and more. OD also encompasses many different types of work, ranging from change management, to leadership and team development, to large-scale system change, to coaching. Some of the ways that OD is unique from other fields include its focus on system-level change; the importance of self awareness and the idea of one’s self as the tool of work (called ‘use of self’); and a focus on how the people within an organization experience change. A focus on growth, learning, and giving people and organizations tools to help them develop their own solutions, rather than relying on the practitioner. This also encompasses the belief that the people in an organization know their situation the best, and thus the role of the OD practitioner is to help and support them in determining what will work for them. Focusing on the processes used to achieve goals; in other words, on how things are done, not only what is done. The belief that personal growth and satisfaction can be fulfilled in tandem with pursuing organizational goals. The application of behavioral sciences to organizations and systems. The importance of social and personal dynamics within organizations. Often more focused on long-term, sustainable change. One of the ways in which OD is unique is that it holds to a strong set of values and beliefs. Kurt Lewin, widely considered the ‘founder’ of OD, came to the US to escape Nazi Germany. He developed his work based on deeply-held humanistic principles, values which are still a vital aspect of the field today. 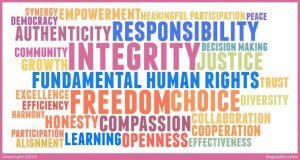 These values, based on the belief that people are inherently good and deserving of respect, serve as guiding principles for OD practitioners. While there are many versions of OD values, below are some of most commonly held (Anderson, 2015). Participation, involvement and empowerment: the idea that those who are impacted by a decision should be involved in making those decisions. This also involves ensuring that people have a voice and are able to participate authentically and safely express themselves, no matter their position. Growth, development, and learning: helping people achieve success through personal growth and development. Seeing challenges as opportunities to learn and providing the support necessary to do so. Valuing the whole person: the belief that people can contribute beyond their job titles or descriptions; that their feelings are worthy of respect and consideration; and that there are benefits to accepting differences. Dialogue and collaboration: open dialogue and communication leads to collaboration rather than competition. Working together can lead to win-win solutions rather than win-lose ones. Authenticity, openness, and trust: being transparent and honest about one’s ideas, opinions, motivations, and so on. OD is an extraordinarily flexible field. People practice OD in their own ways, drawing upon what is important and meaningful to them. Here are some examples of what practicing OD can look like. Izzy is an internal OD consultant. Her role encompasses several initiatives that are focused on helping the company newly formed from a merger. Izzy worked with the newly formed Executive Team to develop a plan to implement the changes necessary for the new company to succeed. She facilitated multiple strategic planning meetings, proposed multiple communication campaigns, coaches executives on their leadership and communication styles, implemented an engagement survey and manages the resulting action plans on an on-going basis. Olly is an independent OD consultant. Olly focuses on companies implementing strategies like promoting diversity or collaborative team building. Olly works with the leadership of the teams and helps them understand the forces that support or detract from achievement of their initiative’s objectives. He develops and implements training for all levels of the organization. He consults with the organization on how they should measure progress going forward. Sally works for a company who sells an Enterprise Resource Planning System. She works with the client companies to evaluate their readiness for change, develops the corporate steering committees, consults on processes that need updating, presents training, problem solving and communication meetings. Anderson, D. L. (2015). Organization development: The process of leading organizational change. Los Angeles, CA: Sage Publications. Organization Development Network: History of Organization Development. (2018). Retrieved from https://www.odnetwork.org/page/HistoryofOrgDev.